Can it really be (Finished Object) Friday already?? D and I decided this week has somehow been compressed, because it seems about 2 days ago it was Friday and we were going to some parties. It's quite unsettling actually. So despite high hopes of showing you a finished tunic today, time compression and the knitting gods have conspired against me, and I have only a couple of crochet FOs of the kind that are popping up all over the place at the moment. The first is a cover for the new (small) Kindle we gave my Mum for Christmas. HOOK: 4mm - this produced a cushy fabric which didn't need lining. CONSTRUCTION: Starting with a chain of 19 (I think!) 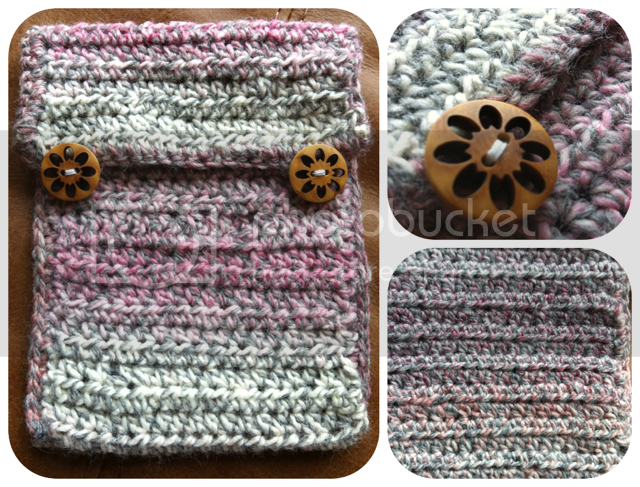 this was crocheted in one long piece and then slip stitched together at the sides to form the right sized pouch. The slip stich edging was continued along the flap with a little chain to form each button hole. 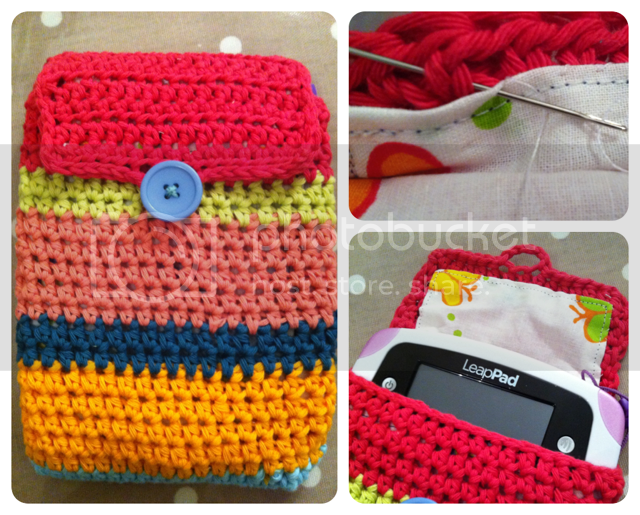 The Kids each received a LeapPad Explorer and the case that was ordered for the pink one wasn't the right size, so it seemed like a good opportunity to use up some more scraps of my least favourite cotton! CONSTRUCTION: the shape of the LeapPad Explorer is irregular - tapered slightly at both ends - so I wanted the sides to be more flexible than the Kindle cover and this is constructed in the round. The base (light blue) was started with a chain of 17 which I crocheted around with 4 sts into each end to make the corners, and then the pouch was continued in the round until it was big enough for the gadget. I then switched to rows for the flap. This is the first lining I've made for a crochet item due to the shape of the LeapPad, I decided on a lined strip with open sides rather than a pouch. The lining was cut to shape, then hemmed on the machine and then hand stitched into the cover around the flap and the front but not all the way down into the pouch. As with the Kindle cover, I finished off with a slip stitch edging - decreasing by one stitch on each side of the opening to account for the tapered content and making a little button-hole loop with a few chain stitches. I'd call these "faffy little things" especially the lined one - but it was surprisingly enjoyable to make them and those lined crochet bags on my Pinterest crochet board suddenly seem a whole lot more appealing! Ooops - it's almost time to go out and I'm not at all ready, so I'll get going, but I can't wait to see the FO's at Tami's later as I'm hoping for the Christmas gift reveals today!!! They're both lovely, not to mention practical. I should make DH a cover for his Ipad. Love the cases - they add personality to mass produced gifts :). Thanks for introducing me to the word faffy :). Happy New Year! Love the cases - so cute and great idea! Lovely cases! I actually just had time to sit and read through other pages on your blog and always wondered what "cwtch" meant! Now I know!! Happy New Year too all of you! What a good idea, I love the cases! Your pouches look wonderful! I think the lining adds a little something extra to it. Good job! Love them. Now I wonder why I even bothered to buy a case for my Nook. Duh! I could have knit one. Isn't it crazy how the days fly by? I think the Kindle case is great especially those buttons, my mum needs one for hers and your have made me move myself to make one for her. A New Year project I think.